I always thought the only place worse than Chicago for traffic would be New York City. I think I may have been wrong. Washington, D.C. is a nightmare. A lot of big city traffic headaches come on the freeways but Washington, D.C.’s surface streets are amazingly awful. We stayed pretty close to downtown but tried to venture out in to the neighborhoods for meals. We had a fairly early end to our day on Saturday so my colleague started asking around for restaurant suggestions. The one he kept getting was for the Federalist Pig. Unfortunately, they were closed by the time we made it out that way so we started looking for back ups. We tried another brewery closer to our hotel before getting frustrated with trying to drive around town and just started heading back. He was going to go out with some friends and I figured I’d just find a place I could walk to from the hotel. 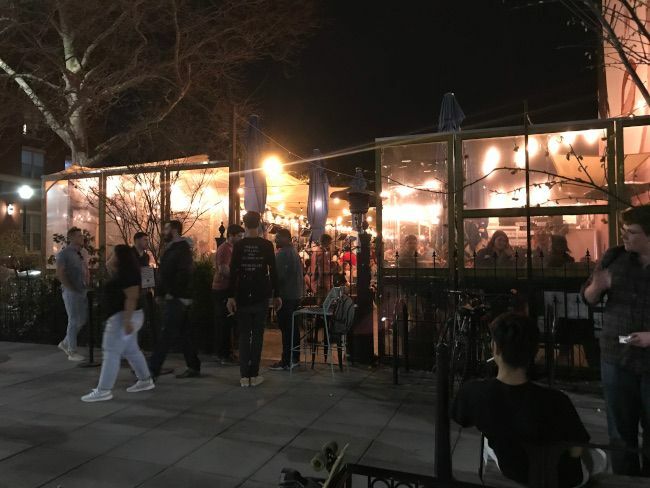 We passed Dacha Beer Garden on our way back to the hotel. That’s a place that had been on my list of places to try while in town since it was close to us and, as luck would have it, there was an open parking spot right in front of the building. I whipped into the spot before asking my colleague if this was ok. It had beer and food so he was on board. Dacha Beer Garden is an open air beer garden on the corner of 7th and Q Streets in the Shaw Neighborhood near downtown Washington, D.C.
I’m not sure what I was expecting but I was not expecting this to be an actual beer garden. There are walls but very little in the way of a ceiling. There are heaters everywhere to keep the place warm on colder days. There is some canopy cover but those are temporary and can be removed once the weather gets nicer. The seating is mostly picnic tables alongside pub tables closer to the bar. 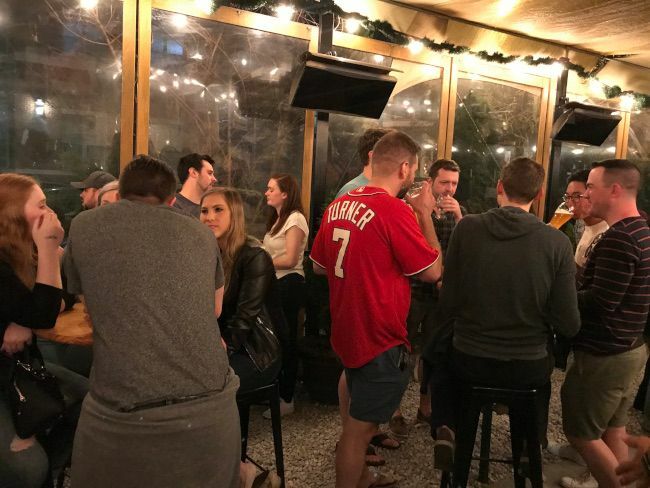 I’m not much of a “scene” person and I don’t normally go to packed bars on weekends so I was a fish out of water in the place. In fact, we were getting made fun of by our friends the next day for going to a place that required a stamp for entry. We made our way to the large bar near the back of the beer garden. We got really lucky that two guys walked away from the bar as we were walking up so we slid into the empty space. 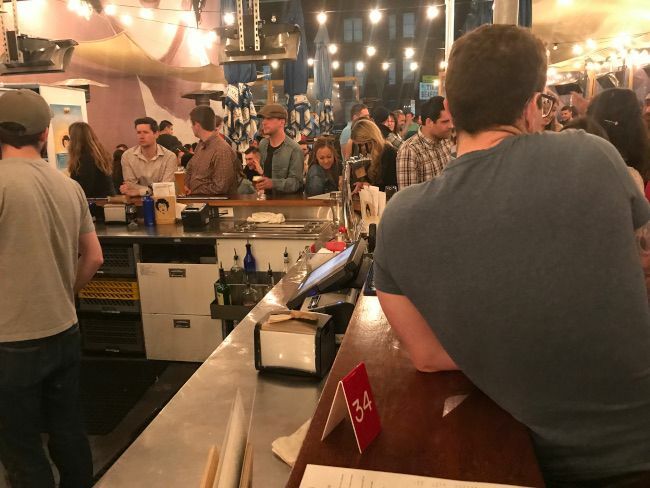 It’s a walk up bar with no chairs that wraps around a huge tower with beer taps. 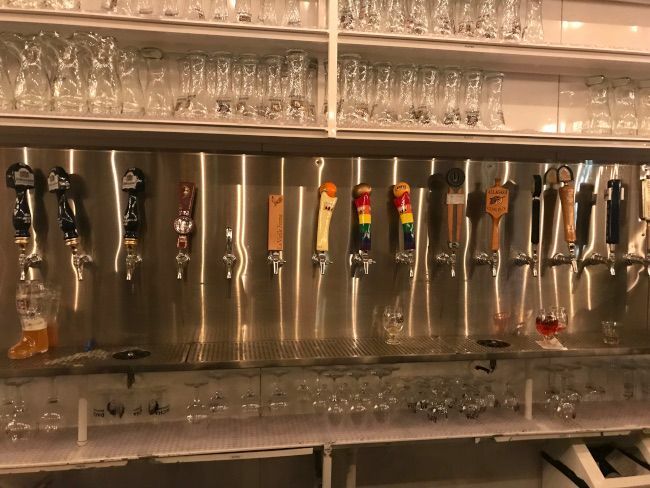 There is a pretty big mix of both German and domestic beers on tap. We grabbed a tap list from behind the bar while we were waiting for a bartender to notice us standing there. 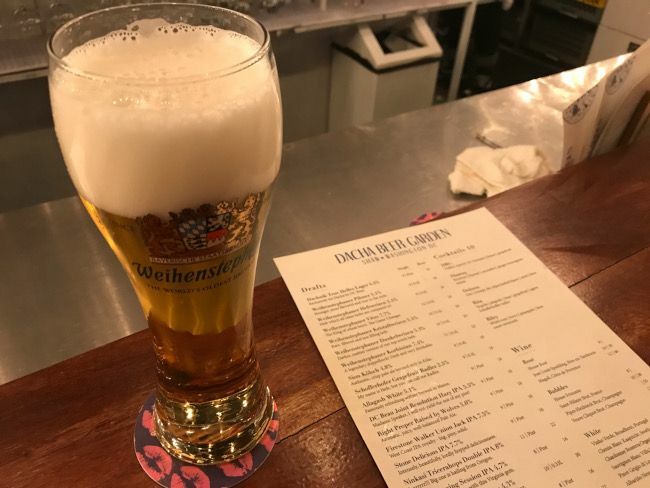 The bartender actually recommended we try Oberon…”it’s a season special from a brewery in Michigan that’s really popular.” I just kind of chuckled but didn’t want to get into a big conversation so I declined and ordered a Weihenstephander Kristallweissbier. I had no idea how to pronounce that so I just pointed at the menu. There’s an option of a half liter or a boot. A boot was tempting but I just didn’t feel like it at the moment. It had been a long day and I just wanted to eat and get back to my hotel. We got pretty lucky that we got to Dacha just before the kitchen closed. I think we had about ten minutes to spare but we made it. We both put in an order for the Burger. 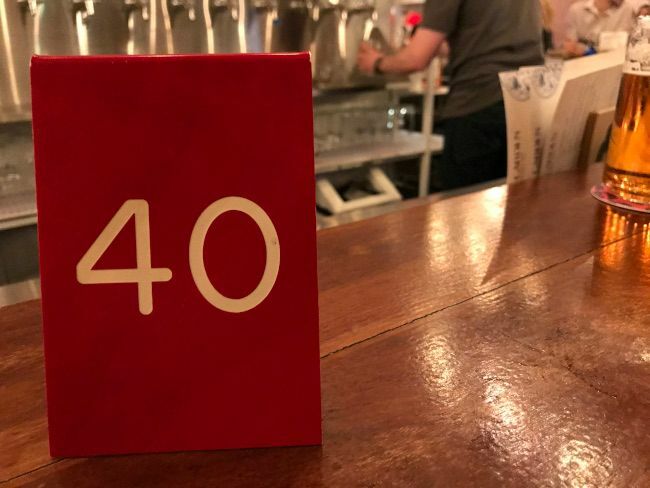 The bartender took a credit card from each of us to open a tab then brought back a little plastic number so the kitchen knew where to find us. 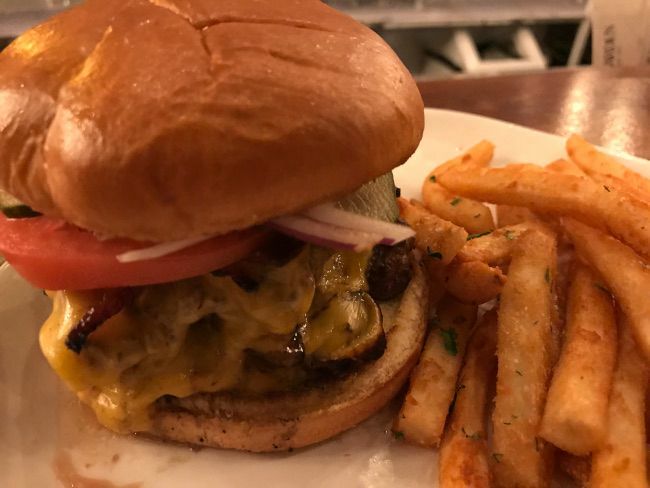 We picked Dacha more out of desperation than anything so we were going to be happy with whatever we got to eat so imagine our surprise when this burger turned out to be really, really good . 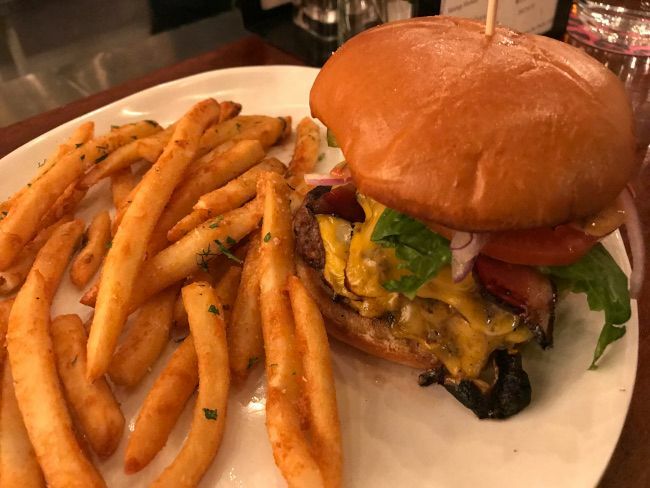 The burger is topped with a peanut sauce, bacon, cheese, lettuce, and tomato. The peanut sauce was a little intimidating but it was a very light flavor that turned out to be something delicious I never knew I wanted on a burger. The burger patties themselves were amazing fresh, salty, juicy patties that would have been delicious on their own. The flavor of the meat really made a statement. The juices from the meat soaked into the cheese and the bun so there was a big beefy flavor through everything. The sandwich came with a side of battered fries. They were pretty simple and garnished with flat leaf parsley. I ate most with no condiments but after a while i grabbed the mustard from the little caddy a bartender set down next to us. My bill for dinner and a beer was just over $32. The restaurant automatically added an 18% gratuity to the bill. 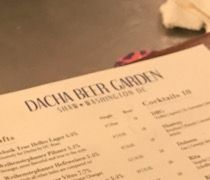 Dacha Beer Garden was on my radar from the moment I found out where we were staying in DC, but it was mostly for the beer. 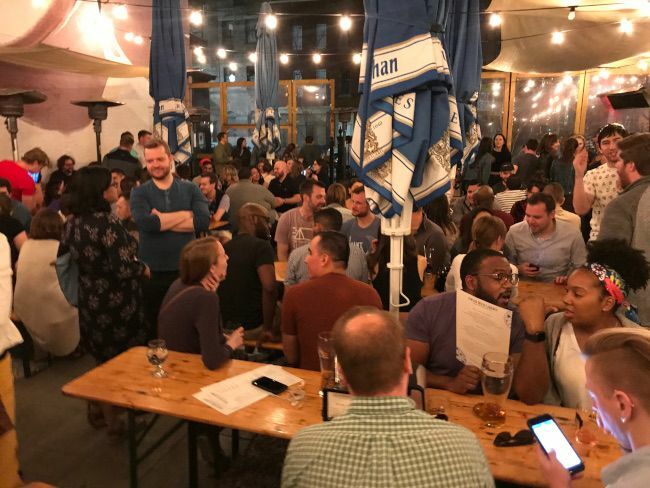 It’s a little more of a young, hip hangout place than you would normally find middle-aged me, but I’m glad we found that parking spot. I was shocked by just how good the burger was. I think we were expecting something a little more bland figuring this place was mostly gimmick but that was not the case. The burger was fantastic…one of the best I’ve ever had.